Lord of the Rings: The Return of the King on VHS. Starring Elijah Wood, Viggo Mortensen, Ian McKellen, Liv Tyler, Andy Serkis. With Sean Astin, Cate Blanchett, John Rhys-Davies, Dominic Monaghan, Bernard Hill, Billy Boyd, Orlando Bloom, Hugo Weaving, Karl Urban, John Noble, Miranda Otto, David Wenham. Directed by Peter Jackson. 2003. The final battle for Middle-earth begins. Frodo and Sam, led by Gollum, continue their dangerous mission toward the fires of Mount Doom in order to destroy the One Ring. 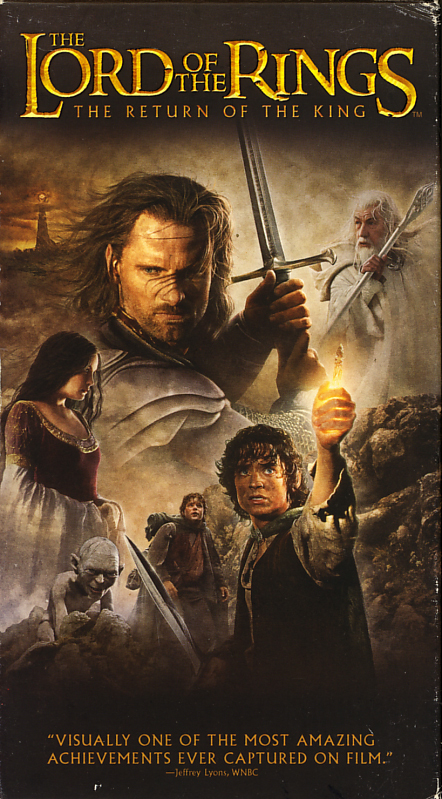 Aragorn struggles to fulfill his legacy as he leads his outnumbered followers against the growing power of the Dark Lord Sauron, so that the Ring-bearer may complete his quest.